It’s apple butter time! Are you a fan? If not, this may be the recipe to win you over- the maple syrup compliments the apples and spices in such a perfect way! Traditional apple butter recipes call for lots of sugar – about 1 cup to 1 pound of apples – making it too sweet in my opinion since there’s sugar in the apples, too. 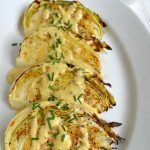 You can, of course, make a version with no added sweetener at all – but that’s basically like spreading applesauce on your toast (again – my opinion, ha!). I think this is such a great balance – natural sweetness from the maple syrup and not a lot of it (just over 1 c. to 8 lbs. of apples), but enough to render a true apple butter that’s SO good on toast and with peanut butter. I also love having apple butter on hand to make these easy bars for snacking and light desserts. Oh, and if that’s not enough to get you on the apple butter train, how about the fact that you throw all the ingredients in a slow cooker before you go to bed and wake up to an almost-cooked apple butter? There’s hardly any hands-on time and in the morning (of course you can start it in the morning and finish it at night if that works better) all that’s needed is a bit more reduction time and a quick whir with an immersion blender. After whirring up to smooth it all into a glorious goodness, you turn the cooker to high for a bit and thicken to a good toast-spreading consistency. 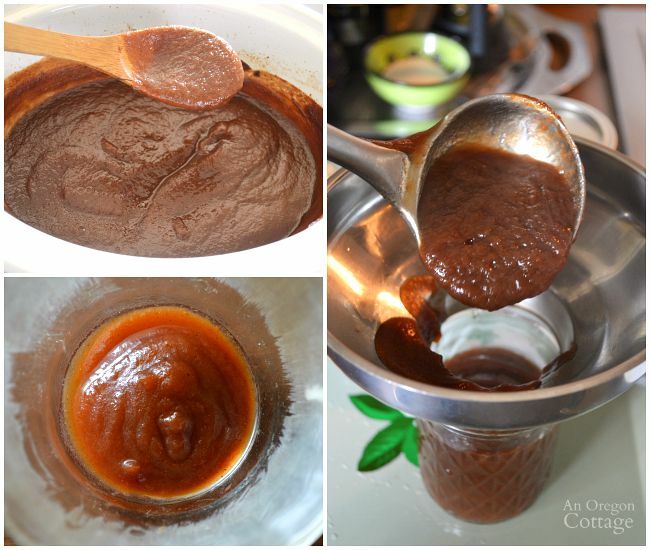 You can go by how it falls off a spoon slowly or add a spoonful to a small cup and see if it keeps it’s ‘shape’ a bit like the lower left photo. And of course tasting is pretty much required at this point! 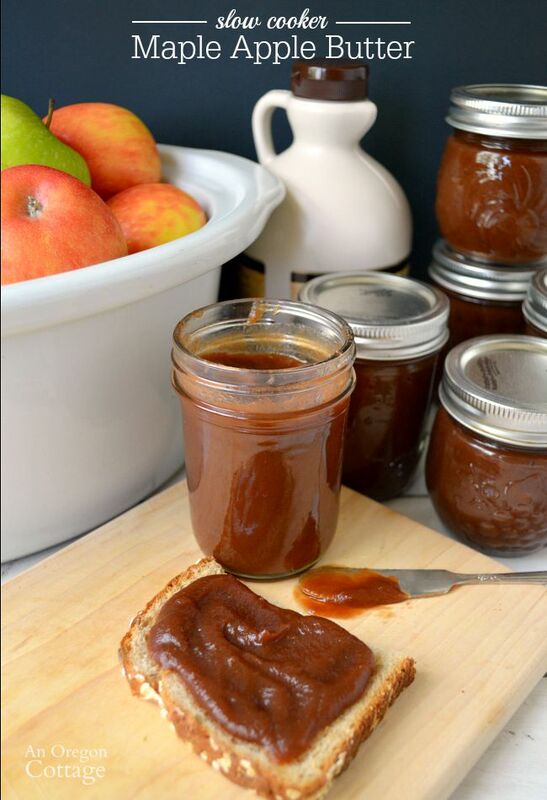 This apple butter can be frozen or canned – it’s really easy to can and is a good recipe to start with if you’re just learning to can. 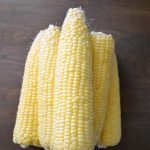 You can see the steps to water-bath canning in this post that covers what isn’t mentioned in the recipe below. 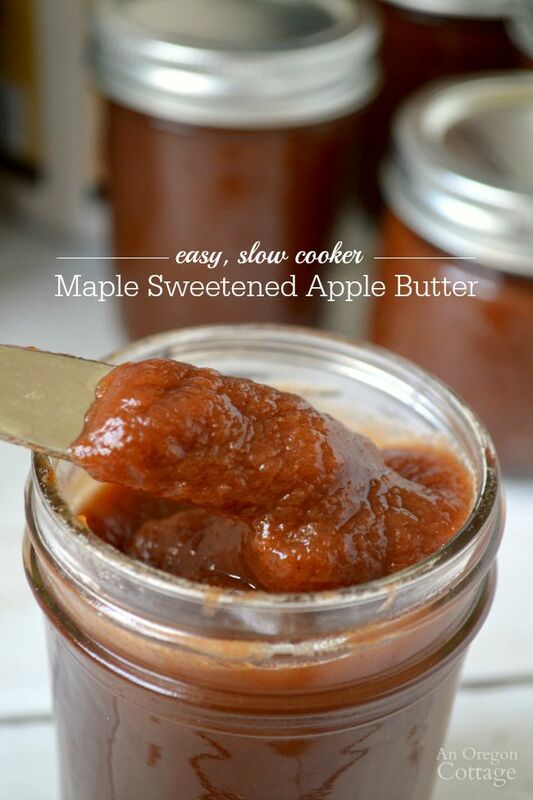 I’m loving this lower-sugar apple butter so much and I hope you do, too! 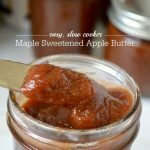 A full-bodied apple butter with maple syrup and spices, but using only a fraction of the sweetener called for in traditional recipes. Perfection on toast! 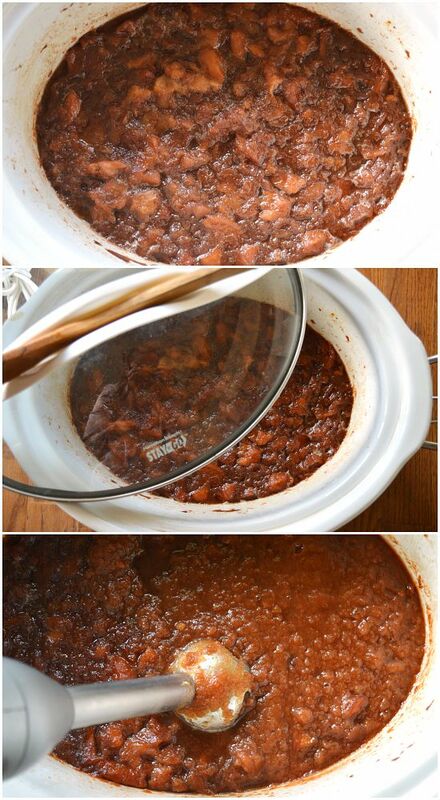 Prepare the apples, placing them right in the bowl of a 5-6 quart slow cooker as you peel, core, and quarter them. Add all the remaining ingredients and stir well. Cook on HIGH, covered, 1 hour. Reduce to LOW, stir again, and cook, covered, for 8-10 hours (overnight works great). Uncover, stir, and cook on HIGH for 1 hour to reduce a bit, leaving the lid off or halfway on cooker. 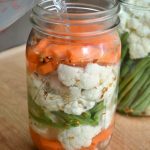 If canning, prepare canning jars, lids and canner while reducing. 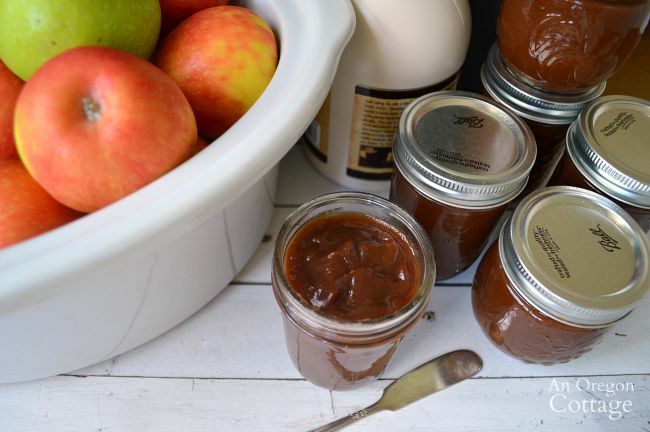 If freezing, let apple butter cool before adding to freezer-safe small jars. To can: ladle into warm 1/2-pint jars leaving 1/4-inch headspace, wiping rims & attaching lids. Place in water bath canner, bring back to a boil, lower heat to maintain a low boil and process for 10 minutes. Remove to a towel-lined surface and let cool at least 12 hours without touching them. Check seals, label and store in a cool place. *I don’t like too many spices in our apple butter, preferring the flavor of the apples with cinnamon and sometimes allspice (it adds a great flavor). You can experiment and use none or all if you want – but the cinnamon is a must! **You want a jam-like consistency. Check by letting fall from a spoon – slowly is the goal – or placing a spoonful in a small container to see if it keeps it shape a bit. I’ve made this a couple years now. I love it. Your picture makes it look thick. Mine comes out very thin. Any idea what I may be doing wrong? Thanks for this recipe. Have been looking for one with maple syrup instead of refined sugar. I am making food gifts for family and it is a challenge not to load them up with sugar (which they don’t want). Making tamari almonds, cajun spice mix, lemon curd (sugar!) and I just added your lovely apple butter to the plan. Thanks again! 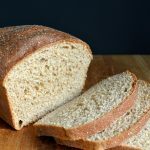 Do you have recipes for other fruit butters? I have a rhubarb butter (https://anoregoncottage.com/honey-lemon-rhubarb-butter/), but that’s it right now – one day I hope to add a pear butter, which I love! Is there an apple that would not be a good choice? I would like to try this soon. I’ve made apple butter last night, because I read your blog and love apples. But I did it on the stovetop with a non stick pot . It took forever, but it turned out great. By the end of cooking time, I had to stay close and keep turning it so it would not stick, and this for about an hour. I added the maple syrup at the end, and not even 1/4 cup. The butter is very tart, so it will be great to put in your bars. Heading to the kitchen to make these for my grand-children. Thanks for the recipe! I just finished canning a batch–I used cinnamon but not the other spices, and for the last hour or so I added some fresh rosemary. So yummy! i have made two batches of this. Love it…and the smell that permeates the house is wonderful. I have found that 1 teaspoon of pumpkin pie spice in it is perfect. Looking forward to making this for Christmas gifts for colleagues at work! Just wondering if one variety of apple works or tastes better than another. Jami, do you have a preference of which type of apple to use? I just use what I have, Kris, but I do prefer apples that are more tart like Gravenstein or Granny Smith. A mix of apples is nice, too. You’re welcome, Wayne – I’m glad you liked it, too! I’ve never made apple butter before. Thanks so much for sharing this. I would love to have you post on my new blog hop—the Weekend Blog Hop at My Flagstaff Home (www.myflagstaffhome.com). It begins on Thursday evenings and lasts through the weekend, if you’re interested. I always get hung up on wording in recipes. Specifically, when you say “8 lbs apples, peeled, cored and quartered”, do you mean that they weigh 8 lbs before you peel, core and quarter then, or after? I always worry that the difference may be significant! I am going to make this recipe as I have a load of frozen windfall apples (which I have already peeled, cored and quartered!). I don’t think you can go wrong with the amount since you can add more spices and syrup if you think you need it! Fill up that crock pot and let it cook to amazing-ness! My guess is that Jami meant 8 lbs before cutting up, but in my opinion, the more the merrier for this recipe!! Yes (thanks Shelby!!) – it’s 8 lbs. weighed apples, THEN peel and core. In some canning recipes (salsa and tomato sauces especially) it’s very important to keep to the measured amounts, but fruit butters are much more forgiving. You can increase the amount if your cooker holds it and adjust up the other ingredients as you do – it’s okay to can still.